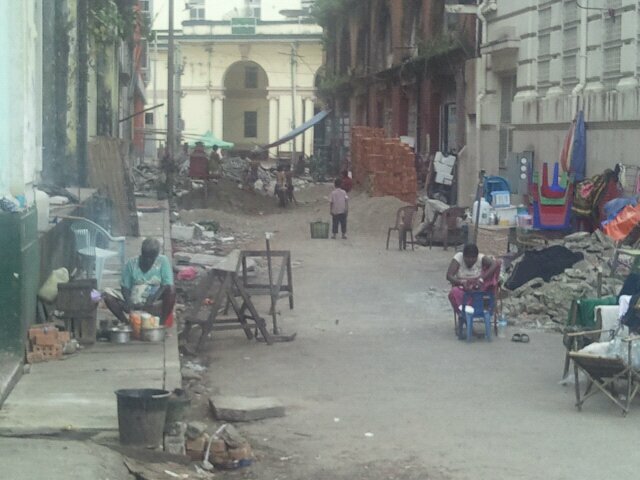 Yangon street near the Strand, the architecture speaks of prosperity. Sadly, that's the last mention I heard of prosperity in Yangon. Photo taken election day 2010. Article from National Times, December 9, 2011. Burma holds the record for the world’s oldest military regime and governments don’t break records for longevity without knowing a thing or two about effective ways to hold on to power. In this field the regime’s skills are impressive. A wrecked economy, health-care funding at medieval levels, rampant corruption, an overwhelming opposition election victory and a popular uprising led by Burma’s revered monks and still the military retain effective control. It’s through this lens Australia should consider recent decisions by Burma’s notionally civilian government and take this opportunity to encourage it towards domestic policy change going well beyond the release of political prisoners. Let’s consider some recent decisions by the new government that have so convinced many including governments such as Singapore’s, organisations such as the International Crisis Group (ICG) and many commentators that Burma is on an un-turning road to positive change: recently scores of people who should never have been jailed in the first place were released from Burmese prisons; the Myitsone dam, regarded as a serious threat to the downstream health of the country’s most important river and the livelihoods of millions of citizens, was canned; the government is engaging with Aung San Suu Kyi, the opposition leader whose party overwhelmingly won the country’s last free election; and there is apparently less direct government censorship of the media. Of course it is good news when unfairly jailed people are released from prison, but releasing 200 of Burma’s around 2000 political prisoners cannot be considered a great leap forwards. This figure is especially galling considering the reasons for many of the jailings include “crimes” such as “speaking with the International Labour Organisation” or simply actively supporting democracy. Likewise, the decision to halt construction of the Myitsone dam is positive. But surely no national government expects international praise for stopping a project that would cause such catastrophic consequences for its own citizens downstream. The regime’s positions on so many matters have been so bad for so long that any reasonable step is now seen as disproportionately positive and praiseworthy. In any country aside from Burma these actions would be seen as well overdue, not worthy of praise let alone reward. But Burma has been rewarded with closer ties with western nations and a visit by US Secretary of State Hillary Clinton. While hardliners might find recent decisions somewhat distasteful there’s really nothing happening to fundamentally undermine the military’s pre-eminence. There’s a wiliness too in the way the government drip-feeds announcements of each successive decision. In practical terms the regime’s desires are simple: they want the removal of sanctions for economic reasons and they want the chair of ASEAN in 2014 for prestige and political reasons in the short-term and economic reasons in the longer-term. So far, western governments such as the US and Australia sensibly haven’t indicated an immediate desire to budge on sanctions, but there does seem to be an increasing likelihood Burma will assume the ASEAN chair and host the 2014 ASEAN summit. All of this poses a significant dilemma for western nations who are reluctant to remove sanctions too soon but want positive changes, both small and big, to continue. Australia, like the US, believes the release of Burma’s remaining political prisoners is a pre-condition for the removal of sanctions but a focus on political prisoners exclusively risks wasting an opportunity to achieve further important changes within Burma. Australia should take the opportunity afforded by the Burmese government’s new openness to put on the table a desire to see other practical changes within the country before sanctions are lifted. Obviously the prisoner release is a given but Australia should also include a desire to see a significant increase in government spending on health care for ordinary Burmese citizens. Burma’s health-care spending consistently ranks near the bottom of global statistical tables and, not surprisingly, health outcomes do too. According to the World Health Organisation, the life expectancy of Burmese citizens is well below the global average and poor when compared to other countries in the region. This has rightfully been a cause for significant criticism from NGOs but so far, improvements in health for Burma’s citizens is not a pre-condition for western nations removing economic sanctions. This should change. There is an opportunity for Australia to take the international lead and make the provision of better health care for Burma’s citizens a key issue, alongside the release of political prisoners, that could lead to the removal of sanctions. This would provide genuine encouragement for Burma’s new government to re-order budget priorities dedicating more funds to health while giving western nations an important domestic goal. It would also significantly improve the lot of ordinary Burmese citizens and be a further measure against which the country’s progress can be judged. Unlike political change within Burma, which experience shows, can be all too easily reversed at the whim of the country’s leaders, spending on health care would be more difficult to quickly reverse and would deliver positive results for Burma’s citizens in the meantime. The Burmese government might be open to a better dialogue with western nations but the question now for Australia is whether we are open to a smarter engagement with Burma aimed squarely at delivering better results for ordinary Burmese whose welfare has for too long been invisible to the international community and, most tragically, also to their rulers.